Holiday Inn Club Vacations has been offering dream vacations for holidaymakers across the United States for around 70 years. Their success has been built in part on the high levels of customer service provided by the company’s Owner Support Group. This team of 270 employees handle club member calls from across the world, answering queries about any of the Holiday Inn Club’s 26 luxury resorts across the US. It’s a demanding job where the environment is fast-paced and service expectations are high. Communication is key when customers rely upon staff to give them the best holiday experience. But changes can happen quickly or without warning – weather warnings may affect bookings, availability can suddenly decrease or increase, or new marketing promotions can be released. Up-to-the-minute information is essential for staff to successfully handle customer queries on these or any other topic. Lisa Christie, Director of Owner Support Group, oversees this critical service function at Holiday Inn Club Vacations. She says: “Our employees are on the phone constantly. We don’t want to interrupt what they’re doing, but at the same time, they need immediate access to accurate information. The risks of communication breakdown and impact on customer satisfaction caused Holiday Inn Club Vacations to introduce a range of SnapComms communication channels. They selected desktop alerts, scrolling desktop tickers, quizzes and surveys. Each of these channels completely bypass email and grant staff greater control over managing the delivery time and format of messages. The new communication channels were used by Holiday Inn Club Vacations for a variety of different informative and culture-building initiatives. Examples of these included advice on new processes regarding the customer points system, updates on resort renovations, marketing campaigns, culture-related content, and more. Scrolling tickers are used to keep staff informed of ongoing situations, such as caller queues and status updates, while quizzes and surveys encourage staff to share feedback. Val Marquez, a Project Manager within Christie’s Owner Support team, has been instrumental in introducing smart uses of the channels to improve comms efficiency. One of these was having different colored Alert templates depending on the message type. That is, red = urgent or read now, blue = important but can read later, other colors = general information. Special features such as message recurrence, audience segmentation and quick publish make management of communications much easier for Marquez and the team. Messages can be targeted to specific staff members and repeated until everyone has seen it and/or acted upon it. Quick publish allows messages to be prepared in advance, such as for potentially disruptive events like a power failure, system outage or severe weather warning, ensuring everyone can be instantly informed and negative impacts minimized. User-friendly dashboard reports provide valuable insights into metrics including who’s read which message, helping staff improve effectiveness of all future comms. 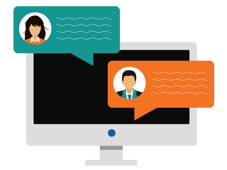 Since being introduced by the Owner Support team in 2014, the SnapComms platform has become central to how the team communicates. “It’s a very user-friendly system that’s now part of our culture,” says Christie. The results speak for themselves. Holiday Inn Club consistently achieve 100% cut-through, guaranteeing staff never miss an important message and customer service isn’t compromised. Through smart, best practice use of the channels, Christie and her team have addressed the concerns over previous communication tools, helping continue the high levels of service they are renowned for – and which their customers expect.